What’s the Safest Way to Pass Trucks on the Highway? You are here:Home>Texas Car Accident Lawyer>What’s the Safest Way to Pass Trucks on the Highway? A common scenario on the highway: you’re a car driver wedged in a seemingly endless line of slow-moving trucks. You’re not willing to sit behind a semi, but you’re also worried that passing could lead to catastrophe. After all, trucks have larger blind spots, need a lot of time to maneuver, and take forever to pass. As you prepare to pass, keep a healthy distance between your car and the truck in front of you. At minimum, 30 feet should separate the two vehicles. Signal clearly to indicate your next move. The left lane is referred to as the ‘passing lane’ for a reason; it’s the safest place to pass any vehicle, but particularly trucks and buses. It’s frustrating to be stuck behind a slow truck in the left lane, but resist the urge to pass on the right side. Trucks have huge blind spots on both sides. Pass promptly while still abiding by the speed limit. Don’t hang out in the blind spot area, which, in the left (passing) lane, constitutes the truck’s entire front half. If more than one car passes a truck at once, at least one is virtually guaranteed to end up in the truck’s blind spot. Furthermore, you risk running not only into the truck, but also facing a collision with the other car-or a particularly devastating crash involving all three vehicles. Patience, awareness, and clear signaling can greatly reduce the risk of collision as you drive near-and pass-large trucks. Caution can prevent a devastating accident. Do you believe that negligence played a role in your McKinney truck accident? Or, did you suffer serious injuries during a Texas truck accident? 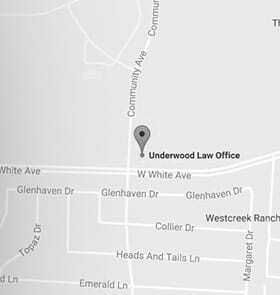 Get help from the Underwood Law Office. Call 469-573-4558 at your earliest convenience to discuss next steps.